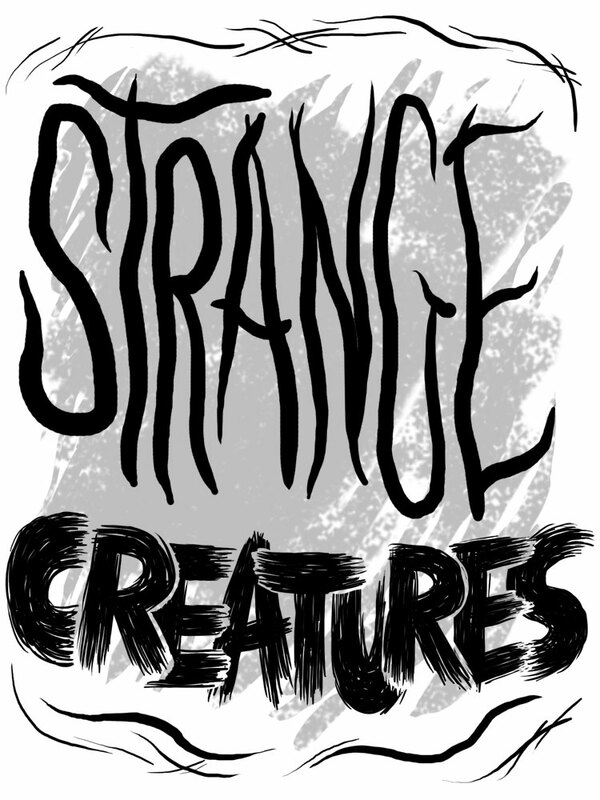 Strange Creatures rated Best of 2013! 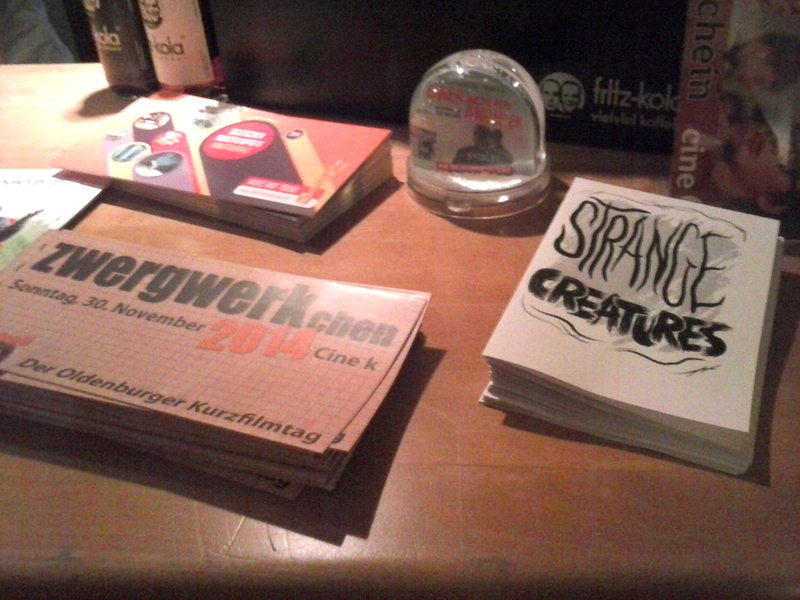 SEAT, Short Film Programs, Strange Creatures Comments Off on Strange Creatures rated Best of 2013! Thanks Kelton Sears! What a nice holiday gift! Strange Creatures – thank you! 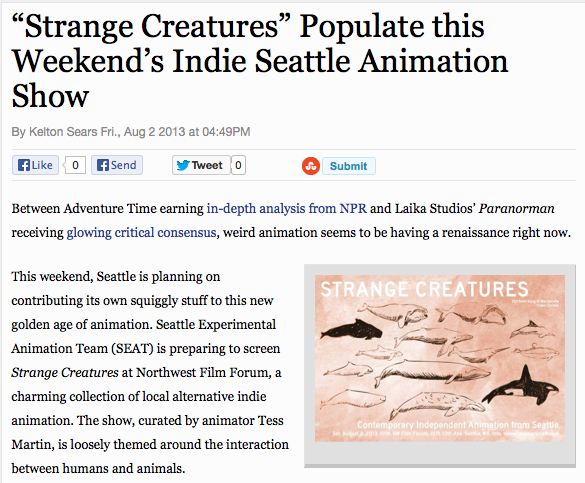 Short Film Programs, Strange Creatures Comments Off on Strange Creatures – thank you! 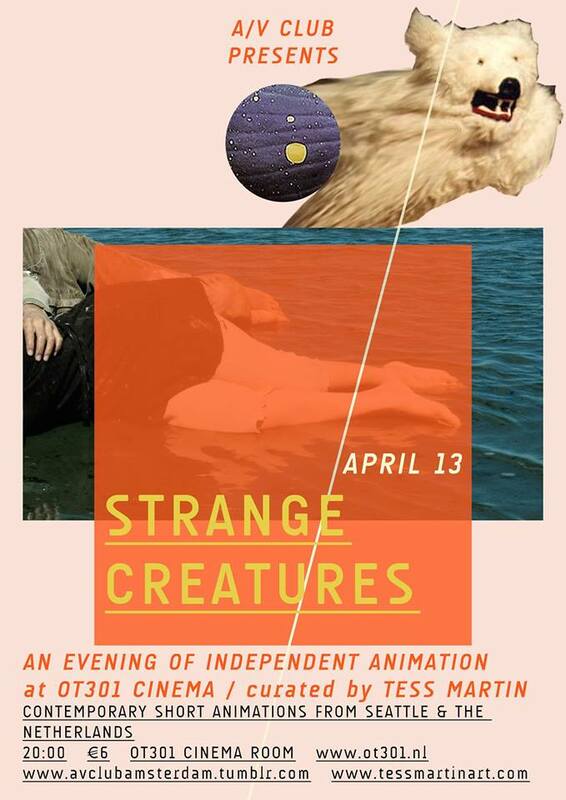 Thank you to everyone who came to yesterday’s screening of Strange Creatures: Contemporary Independent Animation from Seattle. There were a lot of people, laughter and warm fuzzy feelings. 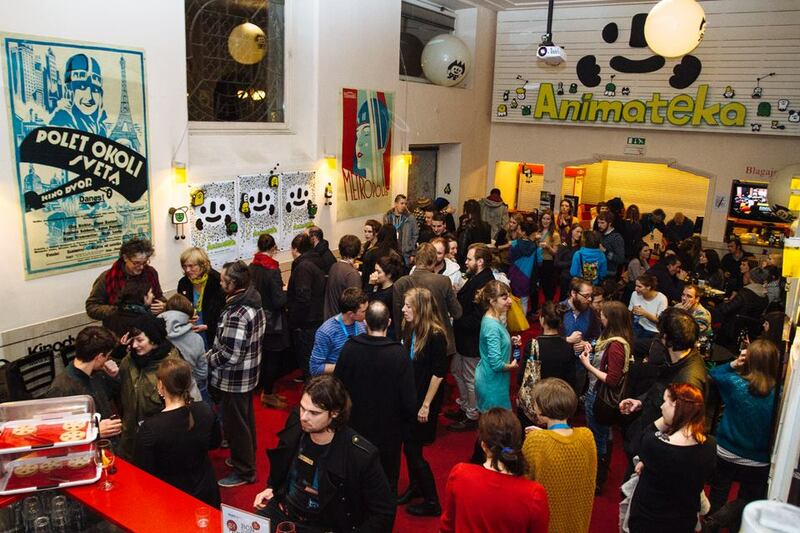 Thank you for supporting your local indie animation community! 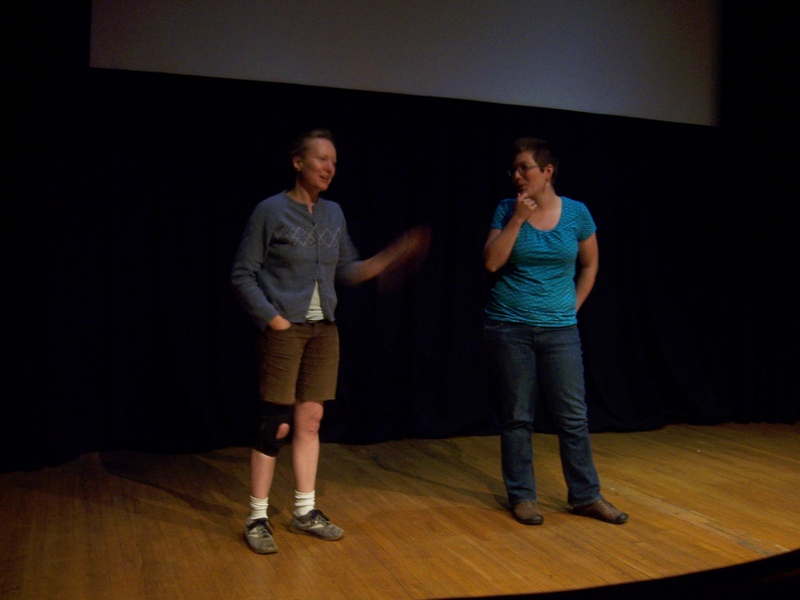 If you have an idea of where the program could screen next, get in touch! Email tess [@] tessmartinart.com. 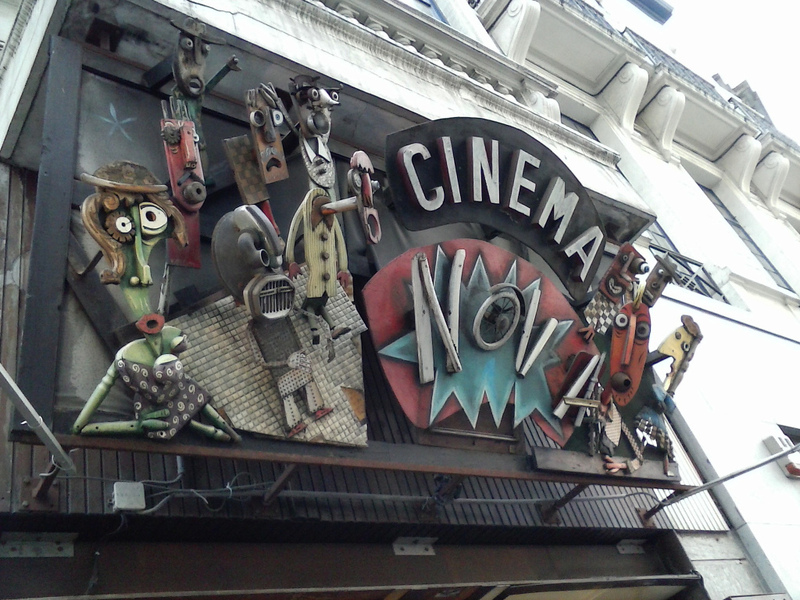 And buy your tickets for the Strange Creatures screening here. 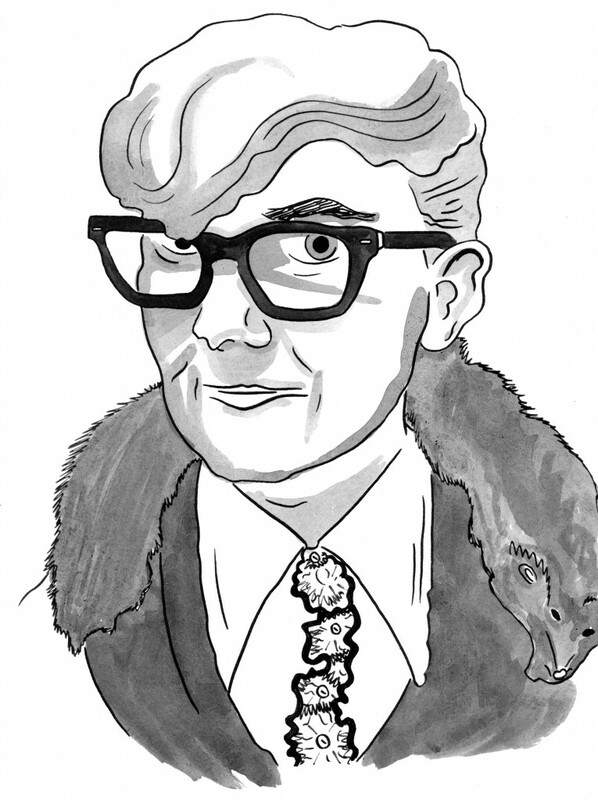 Here are two more protraits you’ll find in the custom zine program when you attend the Strange Creatures screening on August 3rd, made by the talented Kelly Froh. These are of animator Stefan Gruber and Bruce Bickford. 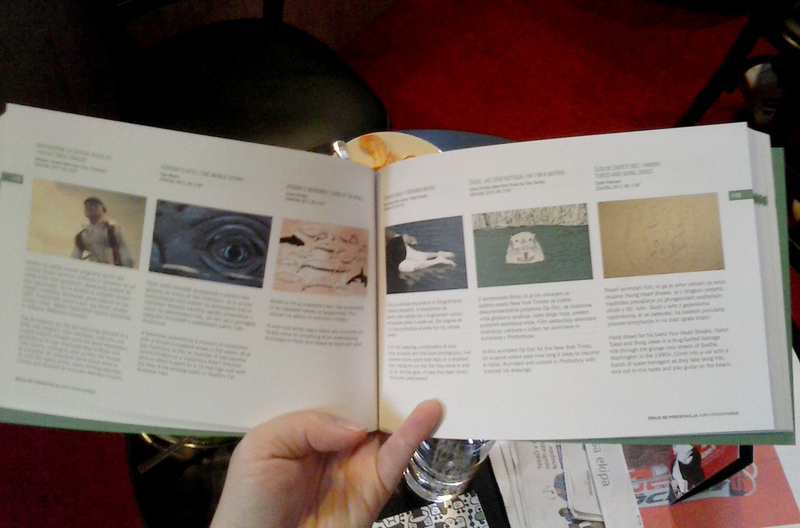 Also, here are some stills from the films, showing all the strange creatures you’ll see! Check the SEAT Facebook page for regular updates about the zine program and other aspects of the evening! I’m happy to announce that on Saturday, August 3rd, you’ll have a chance to see the second program of animated shorts I’ve curated. 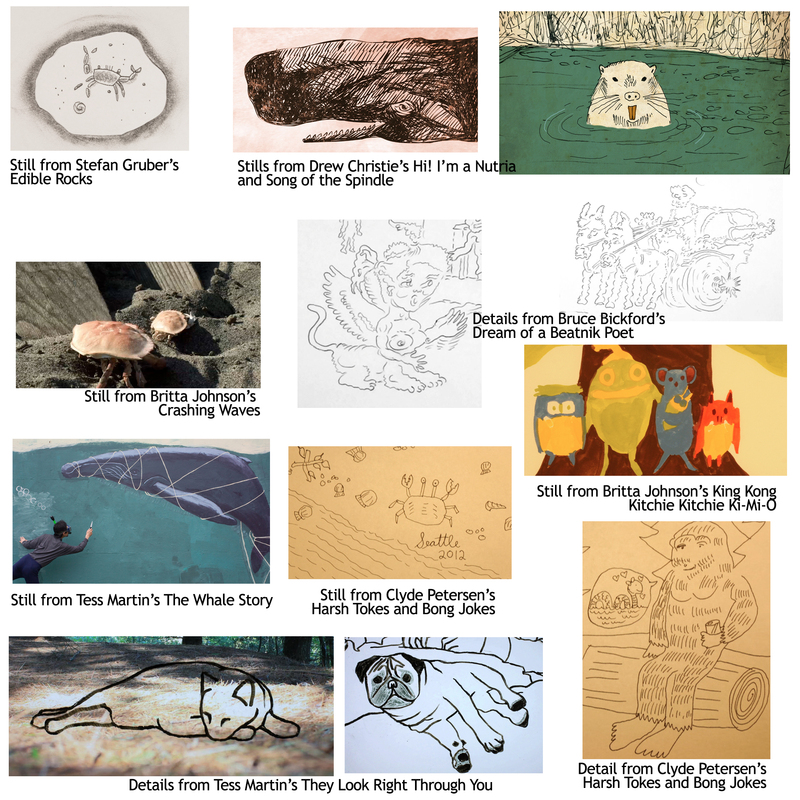 These are also all by members of the Seattle Experimental Animation Team, and this time around they all have animal/nature themes. Ten films by seven artists (including Bruce Bickford!) 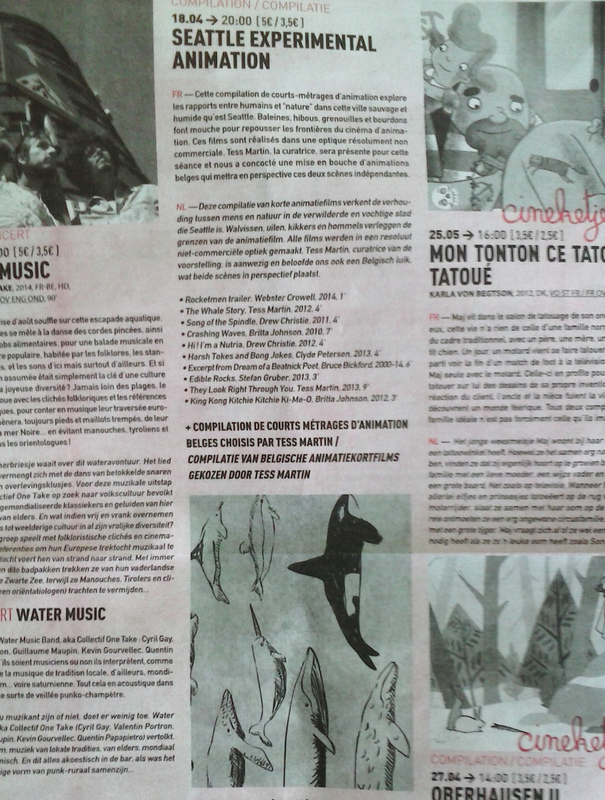 plus a custom zine program by Kelly Froh and Marc Palm. It’s going to be an awesome show and you don’t want to miss it. 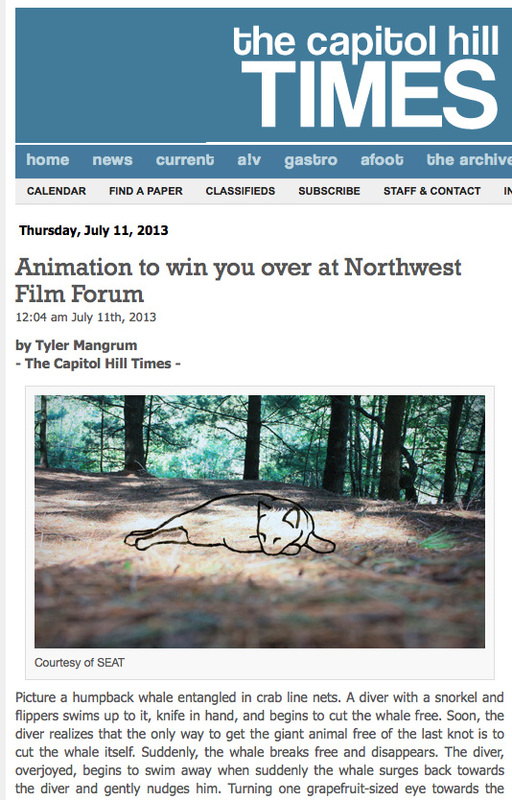 Buy your tickets on the NW Film Forum website. The Pacific Northwest has more than its share of curious creatures. 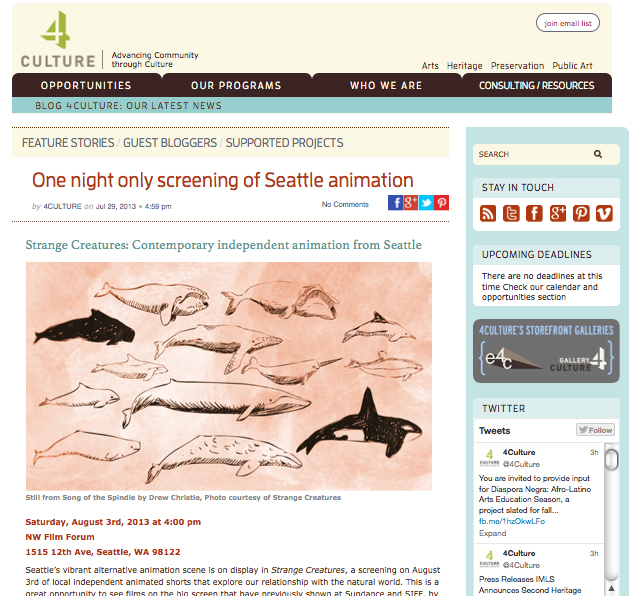 This series of animated films, curated by Tess Martin, showcases the relationship between humans and the natural world in the wet and wild city of Seattle. 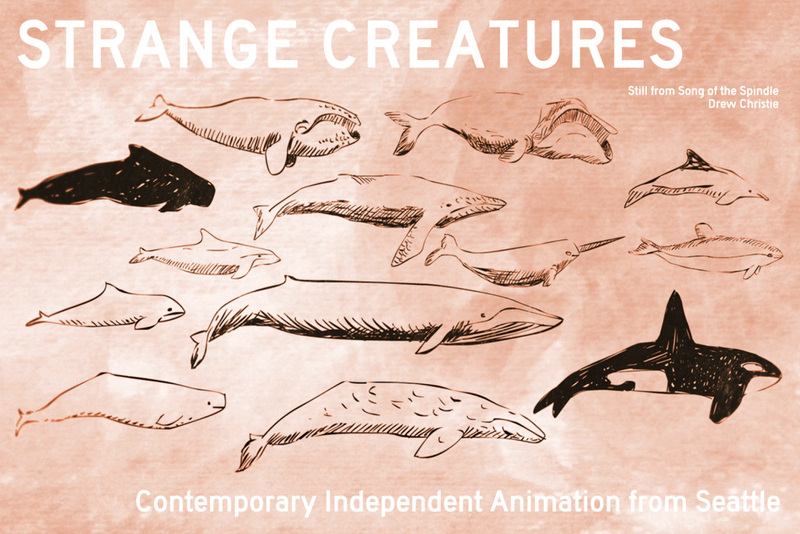 Whales, owls, bumblebees, frogs, cats, dogs and the hairy forest-dwelling giant known as Bigfoot inhabit these flights of fancy created by award-winning members of the Seattle Experimental Animation Team, themselves a rare breed: truly independent creators who push the boundaries of animation. The Rocketmen are the last surviving remnant of a WPA jobs program; their hardware, uniforms and budget haven’t changed since the great depression; generations of men employed atop rooftops and radio towers, waiting to save us from the threats of tomorrow. An adventure serial about what to do until the robots arrive, seven thrilling episodes written and directed by Animator Webster Crowell. Coming in 2013! A fisherman experiences a moment of connection with a female humpback whale in the waters off of San Francisco. Is this an example of inter-species communication or a mysterious fluke? This true story is retold in paint on a 16 foot high wall with the help of the passing public in Seattle’s Cal Anderson Park. A man and whale argue about who is smarter and finally come to something of an understanding. 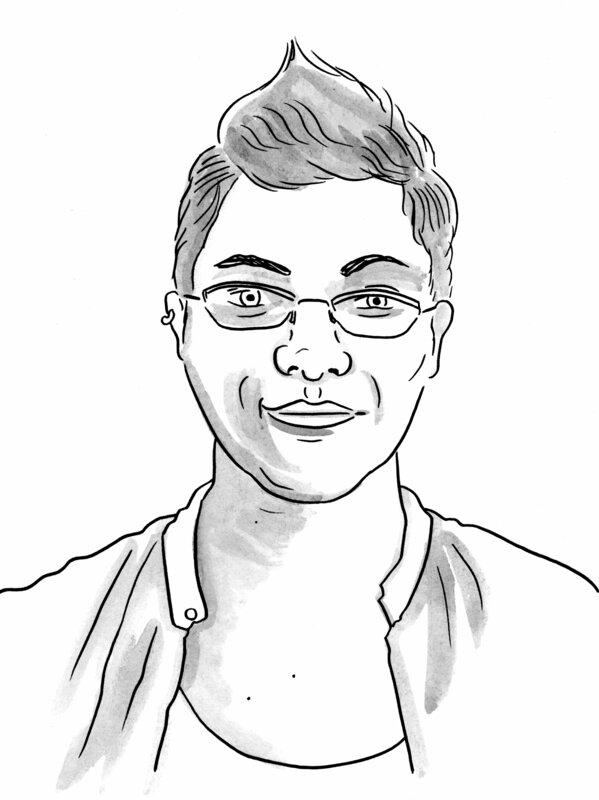 Animated in Flash and drawn by hand with tablet. In this film, featuring a combination of stop-motion animation and time lapse photography, two shipwreck victims spend their days on a deserted shore, making the sun rise, the tides move in and out, etc. Are they gods, or have they been driven mad by their predicament? In this animated Op-Doc for the New York Times, an invasive rodent asks how long it takes to become a native. 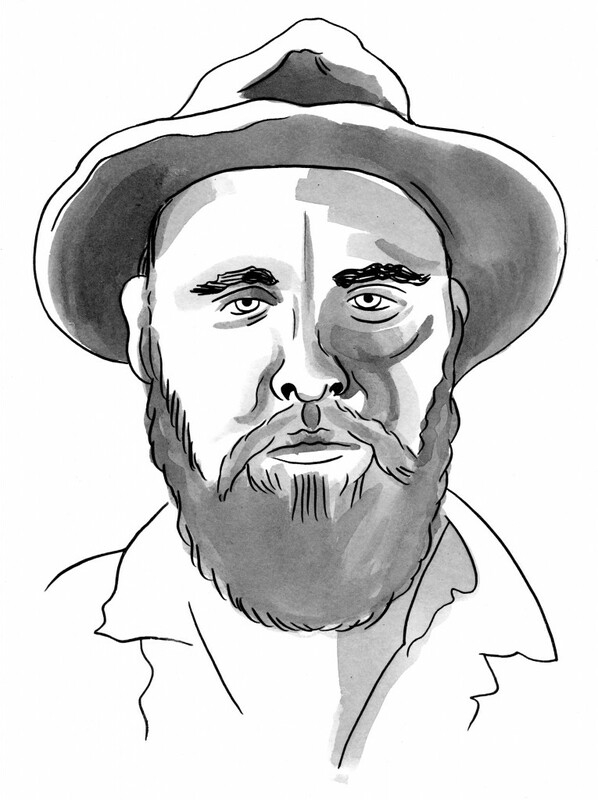 Animated and colored in Photoshop with scanned ink drawings. Hand drawn for his band Your Heart Breaks, Harsh Tokes and Bong Jokes is a drug-fueled teenage ride through the grunge rock streets of Seattle, Washington in the 1990’s. Climb into a car with a bunch of queer teenagers as they take bong hits, rock out to mix tapes and play guitar on the beach. 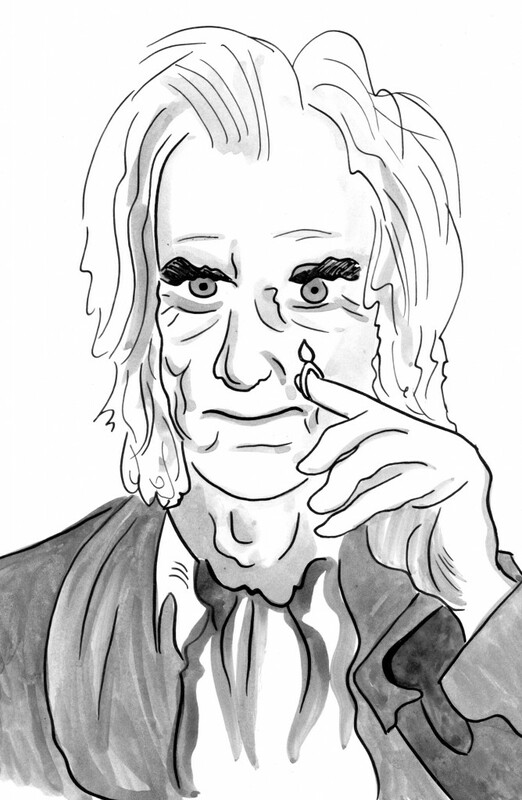 Bruce Bickford, known for his claymation videos for Frank Zappa from the 1970s, continues to animate every day. Working primarily now in fine-pencilled drawn animation, this is a five minute excerpt from one of his work-in-progress films, Dream of a Beatnick Poet. This animation recounts the time when the animator convinced his little brother that there were some rocks you could eat. Made with charcoal, colored pencils and gel pens. Whether cat people or dog people, we all think we have relationships with our pets. But do our pets feel the same way? Can we ever really know how our animals see us, or are our relationships with them ultimately a leap of faith? This marker-on-glass animated short uses interviews to explore the depth and limitations of human-pet relationships, and how we communicate, feel for and understand each other. The strange courtship of a frog and a mouse – an animated music video made with watercolors for Laura Veirs’ song King Kong Kitchie Kitchie Ki- Me- O, featuring Bela Fleck on the banjo. 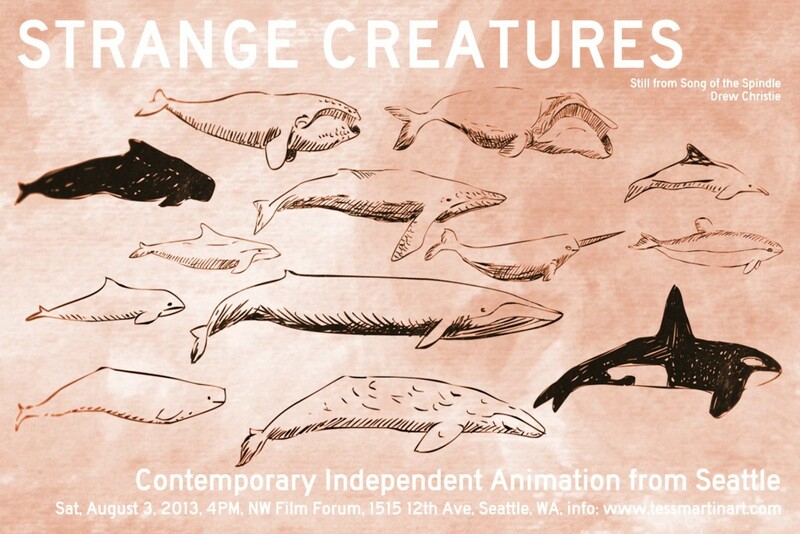 Seattle’s vibrant alternative animation scene is on display in Strange Creatures, a screening of local independent animated shorts that explore our relationship with the natural world. 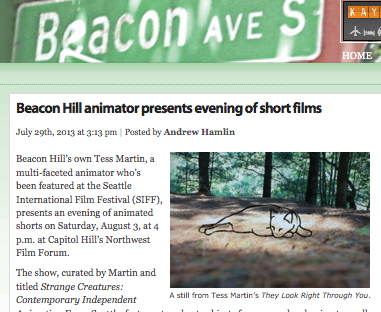 Don’t miss this great opportunity to see films on the big screen that have previously shown at Sundance and SIFF, by award-winning filmmakers of the Seattle Experimental Animation Team: Drew Christie, Bruce Bickford, Stefan Gruber, Webster Crowell, Britta Johnson, Clyde Petersen and Tess Martin. 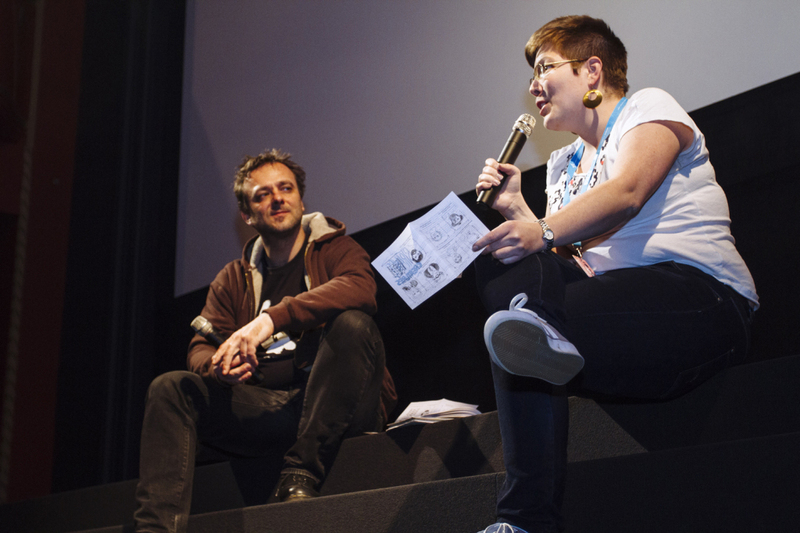 Curator Tess Martin will herself be bringing the program to European venues over the next year, echoing her 2011 tour where Seattle films screened in 15 venues in 9 countries. 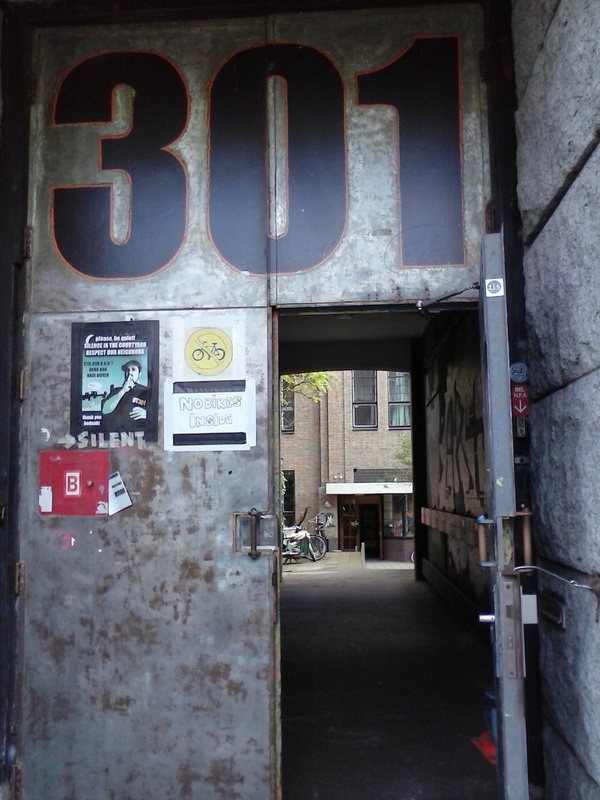 This screening takes place on Saturday, August 3rd, 2013 at 4:00PM at the NW Film Forum, 1515 12th Ave, Seattle, WA 98122. Price is $10/general public, $6/Film Forum members, $7/Seniors, Children under 12 and Students with valid photo ID. 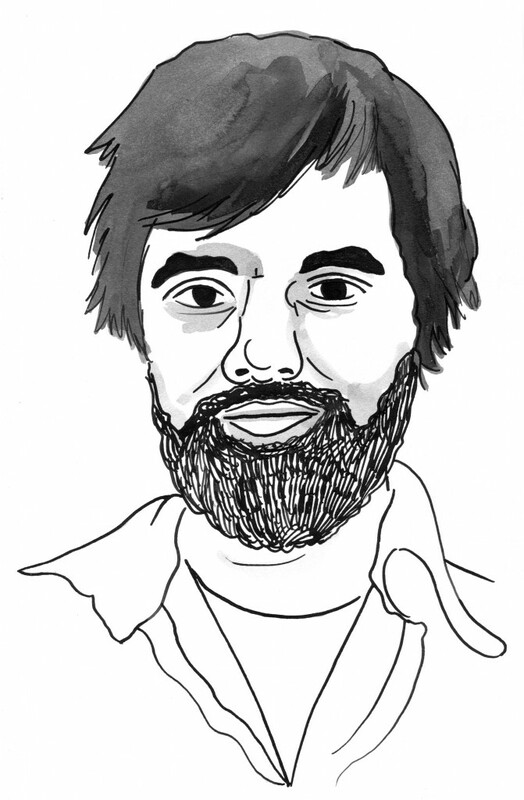 Each guest will receive a zine program designed by Seattle cartoonist Marc Palm, featuring portraits of the filmmakers by comic artist Kelly Froh. This zine will be distributed at every future screening of the program, and will serve to showcase the local comics community as well as the animation scene.